On February 6th, FFA members sent their FFA Proficiency Award applications to Milford to be judged. Proficiencies Awards are based on specific areas of the student’s SAE (Supervised Agricultural Experience) and evaluates the student’s contributions and successes with in their specific areas, including financial investment, money earned, abilities developed, and knowledge and skills that were learned. Eleven members submitted twelve applications. Each of the 12 Districts in Nebraska select their top three, gold rated applications for each of the Proficiency Areas. This year, Fillmore Central had seven qualify for the state competition, which is in Kearney on February 23. Three seniors applied for proficiency: Kyle Broman submitted one in Forage Production Placement (first place gold) and another in Agriculture Mechanics - Repair and Maintenance Placement (silver), Sydney Simacek in Health and Human Services Placement (first place gold), Chloe Stofer in Health and Human Services Placement (second place gold), and Dylan Vodicka Agriculture Mechanics - Repair and Maintenance Placement (silver). Two juniors submitted applications: Brock Tatro in Diversified Crop Production Placement (Silver) and Carson Tatro in Outdoor Recreation Placement (second place gold). Two sophomores applied for a Proficiency Award; Sadie Birky in Agricultural Sales Entrepreneurship (gold) and Haley Korbelik in Poultry Production Entrepreneurship (gold). FFA members can continue their membership after high school. Three of our graduates also applied for a Proficiency Award: Lydia Birky in Small Animal Entrepreneurship (first gold), Alexis Schmidt in Agriculture Education Placement (first gold), Maddy Kimbrough in Equine Science Placement (second gold). 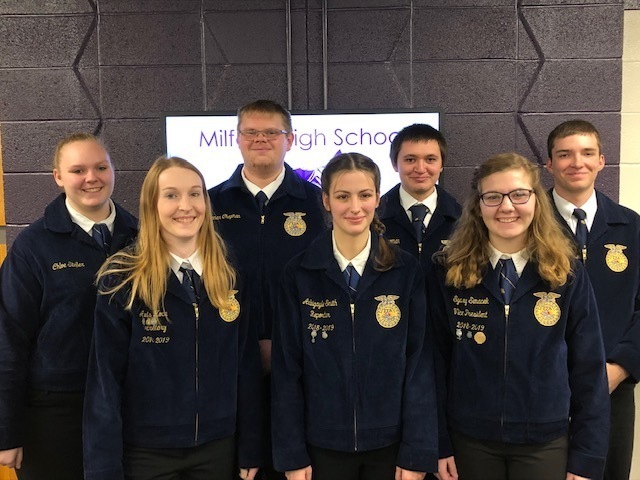 Also on February 6, seven of our senior members applied to receive their State FFA Degree; Sydney Simacek, Avis Koca, Chloe Stofer, Gunnar Chapman, Kyle Broman, Dylan Vodicka, and Abbi Smith. They have kept records of their SAE time and money, FFA involvement and activities, and their community service hours. After the applications are complete, State Degree candidates are interviewed to determine the validity of their records and application and to test their overall knowledge of agriculture education. After the State FFA approves their nominations from our district, they will receive their award at the Nebraska State FFA Convention in April. Congratulations to all recipients and thank you to all the local employers, customers, and other people who helped all make this year’s accomplishments possible.